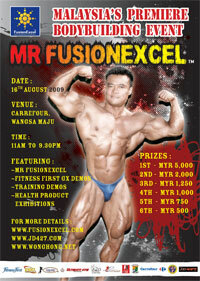 Fusionexcel is the main sponsor for my first bodybuilding contest to be held in K.L. on 16th August 2009. I am collaborating with Jean Daniels (another spokesman for Fussionexcel), Graham Witt, and Terry Gallyot (Mr.Asia and IFBB amateur bodybuilder) are working hard to make this event the best ever in Malaysia. Fusionexcel International, my sponsor since one year ago, has been very generous to be our title sponsor for this spectacular event. Beside bodybuilding as the main event, it is a fitness fair where many other sponsors will be displaying their products at our booths .Other activities include fitness demos and events such as bench press contest and ball juggling!! Our main goal is to create an awareness on health and fitness among the general public. We hope that more people would live a healthier and more active lifestyle in the near future. Also, we are giving an opportunity for the top and up an coming local bodybuilders to show what they've got and get rewarded for all their hard work and dedication to this grueling sport of bodybuilding. This will be the BIGGEST bodybuilding event ever in Malaysia interms of price money and other exciting prizes and hopefully this would encourage more people to take up bodybuilding in the future. We are running out of talents! !